Image: a cataract at the end of the boat trip. Fee: Short tour: Adults EUR 10. Long tour: Adults EUR 15. 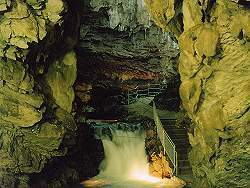 Spelunking tours: after appointment at last 3 weeks in advance. 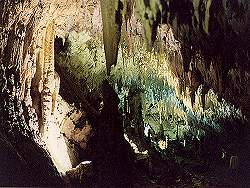 Classification: Karst cave, river cave. Cave Church karst resurgence. Address: Grotta dell'Angelo, I-84030 Pertosa (Salerno), Tel/Fax: +39-0975-397037. 1897 the remains of two cave dwellings were found. 12th century used as church. Image: speleothems in the dry part. 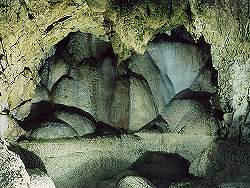 Grotta dell'Angelo was used from the Neolithic Age to the Iron Age by the Palafitte culture. It was used sporadically during the Roman age. The oldest Christian remains found in the cave are of Benedictine origin from the 11th century. They dedicated the cave to San Michele Arcangelo (Arcangel Michael). Image: flowstone and the petrified rim of a former cave lake. The cave is a river cave with a subterranean river, which emerges from a huge portal, 70m above the valley floor. The entrance hall contains an altar for San Michele Arcangelo and the pier where boats are entered. The first part of the following passage is filled by a 200m long subterranean lake, which is crossed on motorless boats. One guide talks to the visitors while another guide pulls the boat along a tightrope, mounted about 2m above the water level. Originally the cave river ran free down the passage and left the cave entrance in a cataract. A dam at the cave entrance increased the water level about three meters and thus flooded the passage with the silent lake. The dammed water is used to produce 370 kW of hydroelectric energy below the cave at the bottom of the valley. This electricity supplies the show cave, the town Pertosa and other villages nearby. The rest of the cave is dry and toured by foot. Huge chambers and richly decorated passages, which are well lit. The lamps are all white, but show different tones of white, and so the formations and chambers of the main passage give the visitor a feeling of enormous depth. Search Google for "Grotta di Pertosa"
Nucleo idroelettrico di Tusciano: Grotta dell' Angelo, the listing of the cave in the database of ENEL, the Italian energy company.